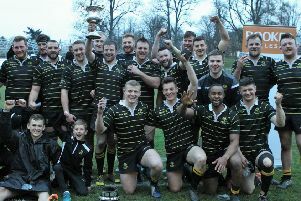 Selkirk made up ground after a slow start to their Kings of the Sevens campaign by winning the Peebles title at The Gytes on Sunday. They scored an unpredicted high margin of victory over Edinburgh Accies in the final and Graham Marshall, the Selkirk coach, had offered his charges the age-old maxim – control the ball, control the game. In the event, the Philiphaugh side did just that against a physically bigger Edinburgh Accies side. “Apart from the first round when we were down 19-0 against Hawick, before winning the tie, we played great sevens today, the best we’ve done all season,” said Marshall. Watched by the Scotland sevens coach, Callum MacRae, Selkirk showed their title potential in the last of the quarter finals with a 22-14 win against Gala before adding confirmation with a 31-14 victory over Boroughmuir to book their place in the final. For Edinburgh Accies, this was their second appearance in a Kings of the Sevens final in seven days, the Raeburn Place side having contested the Berwick final last weekend when they lost to Gala. Accies came through the first two rounds with relatively comfortable wins over Biggar and the Latvian side, Livonia, before facing Melrose in the first of the semi-finals. Melrose looked likely title winners after dismissing the Kings of the Sevens leaders Jed-Forest in the quarter-final but, in the penultimate round, they could not match the power and individual skills of Accies. However, in the final, it was the fast feet of sevens specialists Dashton Wellman – named as player of the tournament – Mikey Davies and Callum McEwan, and the hard running of centre Ross Nixon, flanker Euan McDougall and back row Callum Marshall that undid Accies. All six shared in the try scoring for Selkirk, who finished 38-7 winners over Accies, with Callum Ramm scoring the Edinburgh side’s only try. While Selkirk were jubilant, Langholm winners , Watsonians, were less joyous after becoming an early casualty of the unseeded Peebles draw, which matched the Myreside club with Melrose. The tie resulted in a 12-7 win for Melrose, who then defeated Berwick winners and Kings leaders, Jed-Forest, in the quarter finals. First round - Stewart’s-Melville 10, Jed-Forest 14; Watsonians 7, Melrose 12; Edinburgh Accies 26, Biggar 7; Earlston 17, Livonia 26; Peebles 17, Kelso 0; Boroughmuir 38, Berwick 0; Gala 43, Howe of Fife 12; Selkirk 26, Hawick 19. Quarter-finals – Jed-Forest 12, Melrose 22; Edinburgh Accies 26, Livonia 0; Peebles 22, Boroughmuir 28; Gala 14, Selkirk 22. Semi-finals – Melrose 12, Edinburgh Accies 22; Boroughmuir 14, Selkirk 31. Final – Edinburgh Accies 7, Selkirk 38. 1 Jed-Forest 39, 2 Watsonians 30, 3 Edinburgh Accies 28, 4 Gala 21, 5= Selkirk and Melrose 18, 7= Hawick and Boroughmuir 13.